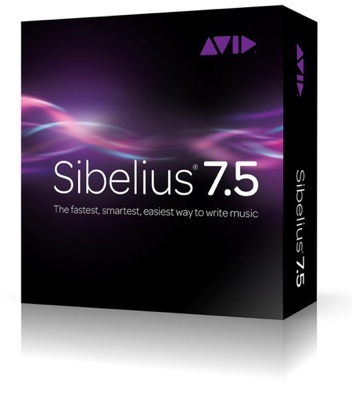 Avid has received a lot of criticism from Sibelius users of late. Two years ago the Finsbury Park, London, HQ of the Sibelius development team was closed, many developers laid off, and the suite’s coding and maintenance operation relocated to the Ukraine. Rumors of serious financial trouble circulated and the company’s Vice President, CFO and CTO resigned. Yet the market-leading score-writing software did not disappear as some both predicted and feared. In fact, a new version has recently been released; here Sibelius 7.5.1 (a significant further milestone release for bug fixes and maintenance) is examined. It’s found to be as good as ever. 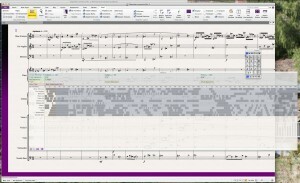 MyMac has looked in depth at both Sibelius 6 and Sibelius 7. Here we concentrate on what’s new in Sibelius 7.5… the strengths of the earlier versions have all been retained. Sibelius logically distributes support files, preferences, soundsets and other settings across the hard drive. But in a completely knowable way. Yet one is understandably nervous that some vital set of data, resource or files could be compromised during a major upgrade. The installer worked quickly and flawlessly first time, as this review was being prepared. And (it should be noted) after a speedy and reliably-executed download from the Avid server. The upgrade process took just a few minutes. Everything that was described in the clear documentation that comes with the product happened just as expected. And within an equally short period of time (under five minutes) a score written in Sibelius 7 with third party Vienna Symphonic Library tools and an Ivory soundset was playing without hitch. Files from version 7 had either been updated or left safely in place. After that good start, major changes to the software’s functionality and features should be summed up (and have been evaluated for this review) in three categories. Central to any score/notation software is the ability to hear instantly what you have written. It’s vital that as many nuances of notation as possible can be heard just as they are intended eventually to be played by ‘live’ musicians. This aspect of Sibelius 7.5 has been significantly enhanced. Tempo markings, metric emphasis, grace notes, mordents, caesuras, and breath marks all sound more natural and less as though they’ve been annotated on a computer. This is important. The coders have done a good job here; such an improvement alone justifies the modest price ($49.95, Sibelius 7 to 7.5 download; $89.95 boxed version) of upgrading. No software can ever sound completely like the real thing in the concert hall. But Sibelius 7.5 comes as close as anything currently available. Specifically, “Espressivo 2.0” has been designed to confer a more realistic feel on the music produced by each part in Sibelius in terms of rhythmic expression – particularly to deliver smoother phrasing. These are accessible from the “Play” tab under “Performance > Rhythmic Feel” in real time. But can be specified in the score; and can be applied instrument by instrument. In keeping with good Sibelius practice, the way in which each of these is interpreted is completely under your control, if you wish (Play > Performance > Dictionary). New such styles can also be created. 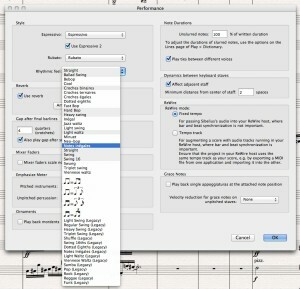 For many this is likely to be an esoteric practice; but, given the huge variety of instruments available to Sibelius users, and environments in which they’ll be used (chamber, solo, electronic, amplified and so on), it’s important that they can be customized as flexibly as they can in Sibelius 7.5. 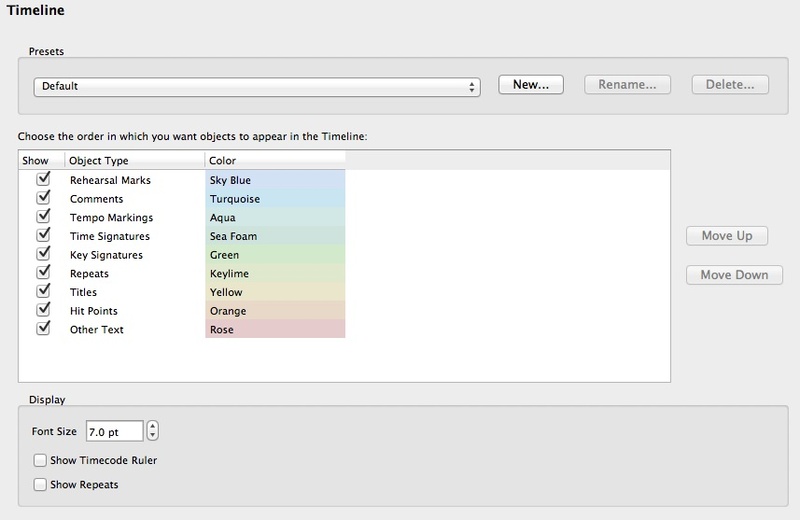 Completely new in this version of Sibelius is the Timeline window. Spend more than five minutes with a score – particularly a large orchestral work requiring many staves – and the fatigue of moving backwards and forwards through what may be many minutes (even hours) of notation can amount to a real disincentive to edit as meticulously as you should. Timeline is a separate window displaying the whole structure of even huge scores. Users of Apple’s Logic (or other DAW software which employ a MIDI “piano roll” metaphor to suggest structure) will be familiar with the representation of bars of music as blocks. Timeline is a happy hybrid between this one-to-one correspondence of bars to blocks and sections of the Sibelius score. 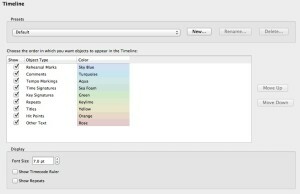 The lower portion of the Timeline window highlights bars currently visible in the main score in yellow. In keeping with other panels in Sibelius, the Timeline can be undocked – and even overlaid on a score using its transparency settings – if you prefer to work that way. The top portion of the Timeline window shows pivotal “landmarks” in the score… meter and rhythm changes, key changes, and text etc. Again, in good Sibelius fashion, colors can be user-defined. You can then navigate to a particular section (“landmark” or bar/block) with a single click. Collapsible, flexible and robust, this was found to be the biggest and most welcome innovation in Sibelius 7.5. Although not all users will need to go beyond scanning and judicious use of the “Home” and “End” buttons, when you do often change key and tempo, and/or when you indicate segments with Sibelius’ celebrated yellow “Sticky”-like comment boxes, Timeline can actually be very useful. For all their being a driven and intense breed, composers also know the value of sharing their work for others to enjoy and/or comment on. Sibelius First is Avid’s simpler scoring tool intended specifically for beginners and those who either don’t need, or don’t wish to immerse themselves in the full complexity of Sibelius. It has a wide array of sharing and social media tools. These are now available directly inside Sibelius 7.5. You can now email your work from within the program. This can be a PDF of the full score; a PDF of separate parts – either in separate PDFs or a composite; in an earlier version of Sibelius for those using previous versions. And you can publish scores in ScoreExchange, YouTube, Facebook, and SoundCloud from within Sibelius 7.5. Avid Scorch is the iPad application that displays and plays back Sibelius scores – effectively making the tablet an interactive music stand and score library. Sibelius 7.5 now lets you export your composition directly to Avid Scorch with satisfactory scaling (no pun intended) etc for display on the iPad. Similarly, Sibelius 7.5 can now export a video of your composition in a variety of resolutions (up to 1080p) in QuickTime, .mov, (or Windows Media Video, .wmv) formats. You have full control of which staves are displayed. The obvious chief use here is in education, and for demonstrations. Like the other new features of Sibelius 7.5 tested for this review, this all worked well. There are other, smaller, changes in Sibelius 7.5… local language support has been added for Russian and Brazilian Portuguese, for example. As noted, the maintenance release, 7.5.1, some time after 7.5 appeared was almost as welcome a set of fixes as the 7.5 upgrade itself. Sibelius has survived and seems here to stay as strong as ever. Conclusion: Sibelius 7.5 is a modest upgrade, as befits its “.5” name (Jean Sibelius didn’t complete his Eighth Symphony: so the numbering system, which has been used in various forms since the software first appeared on Acorn in the 1980s, hasn’t run into trouble yet). Yet Sibelius 7.5 successfully addresses three very important areas of score-writing. Enhanced playback is more than just “useful” in the cyclical process of composition and review. It can make a crucial difference. The Timeline significantly aids the user and adds to their ability to “scroll” around the document efficiently and effectively. And when you have a score ready to share, Sibelius 7.5’s now built-in sharing (and exporting) routines will save you time. There’s nothing spectacular in this release. There are areas of a Sibelius 8 (or perhaps “Kullervo”) that the product’s many users will be glad to see. In the meantime we can’t know what was produced by the new team; what was the fulfillment of the former one; and what is a bit of both. What the release of Sibelius 7.5 shows, perhaps, is that it doesn’t matter: the product is still under active development and undergoing constant improvement. It can be safely recommended. Pros: Still the premiere score writing software; packed with features which truly aid serious composition to score; easy to use; made easier with this release, and with more sophisticated playback and significantly enhanced sharing and exporting options. Cons: There are a very few minor bugs not fixed in this release; and the business of using Sibelius 7 with other Virtual Instruments remains complex and potentially intimidating.